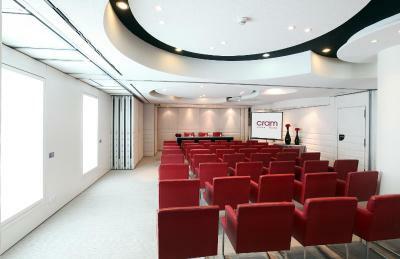 Lock in a great price for Cram – rated 8.4 by recent guests! The location is great and the views from the room were outstanding. I liked that you can control the lights from the bed. GREAT HOTEL!!! I loved everything about it! The location is perfect, there are many shops, bars, restaurants, clubs around, and the historical part of Barcelona is a few blocks away. The hotel is very modern and stylish. Everything was ideally cleaned during my entire visit. The front desk staff was very sweet and helpful. My room was big enough for one person, very stylish and modern looking. The Queen Size Bed was very comfortable. I really loved the balcony and the very pretty city view. The staff is so nice and helpful. The location is great near everything. A 24/7 pharmacy and supermarket are just next to the hotel. The have the most comfy beds ever! Easy to reach town, near metro,nice bars and restaurants around. EVERYTHING! 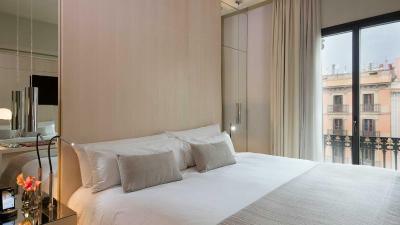 The rooms are small but very well appointed and modern. Every room has a juliet balcony facing city. After complaining about our second room on 2nd floor, they offered to move us to a different floor and included breakfast for our trouble. Unfortunately, only 2 of our 6 nights were in the new and improved room. I believe the maids are doing their best, however, more attention needs to be paid to deep cleaning. The AC vents should be cleaned yearly. Black mold is extremely unhealthy! Location and cleanliness. Staff were amazing and the hotel is super clean. Cram This rating is a reflection of how the property compares to the industry standard when it comes to price, facilities and services available. It's based on a self-evaluation by the property. Use this rating to help choose your stay! 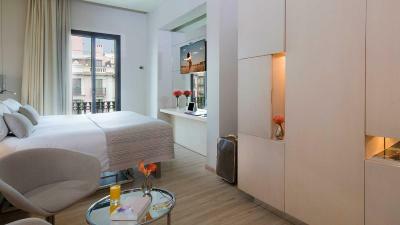 One of our top picks in Barcelona.Hotel Cram is set in Barcelona’s central Eixample district, a 10-minute walk from Plaza Catalunya. 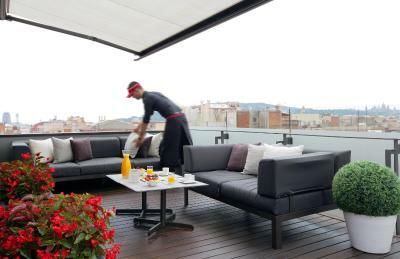 It features a rooftop pool with city views and Michelin-starred Angle Barcelona restaurant. 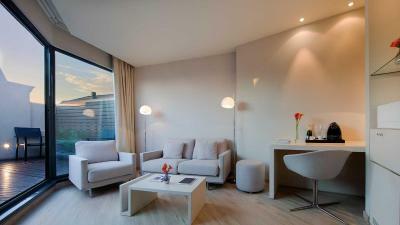 All rooms have free WiFi and large flat-screen TVs. The Cram Hotel is located in a building that dates back to 1892 and features a modernist façade, and a modern, elegant interior. 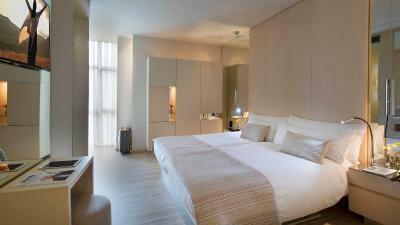 Rooms boast advanced lighting and access control technology. 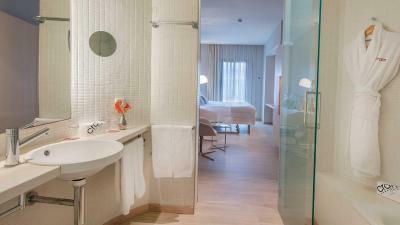 The air-conditioned rooms at Cram Hotel feature a private bathroom with a hairdryer. A bathrobe and slippers are available upon request. 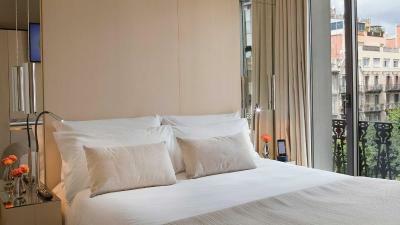 Rooms feature beds by Treca de Paris, and elegant curtains by Gastón y Daniela. Some rooms have a private balcony. 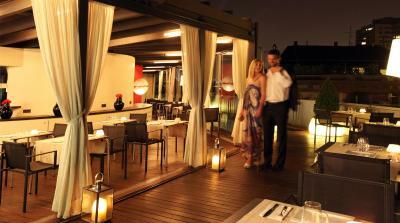 The Michelin-starred Restaurante Angle Barcelona offers modern dishes using fresh produce. 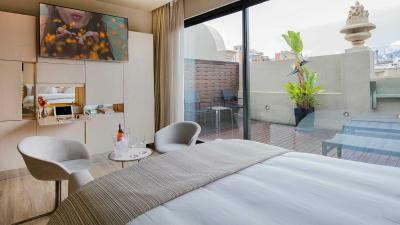 Hotel Cram Barcelona also has a cocktail bar and poolside bar, and room service is available. The hotel has a tour desk and 24-hour front desk. You can hire a bicycle or car. 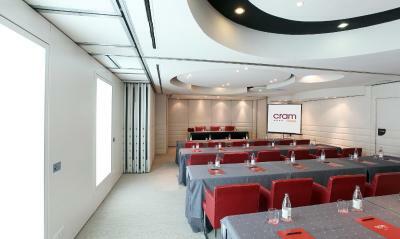 When would you like to stay at Cram? 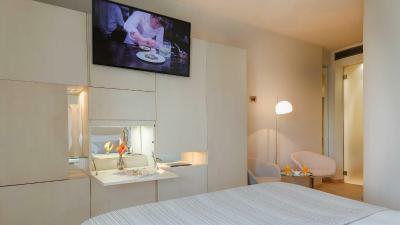 This stylish room has a round bathroom, a queen bed and a flat-screen TV. The hardwood floors and furniture create a cozy atmosphere. 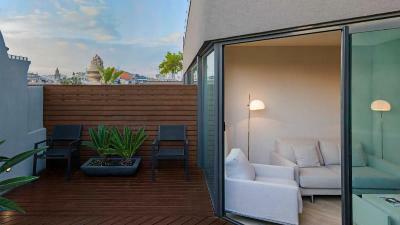 Most rooms have a private balcony. 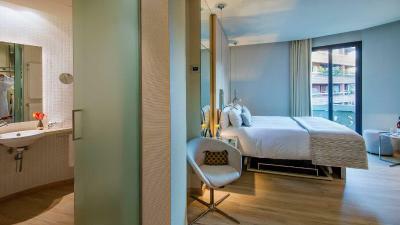 This stylish room has a round bathroom, a king size bed, a flatscreen TV, and a balcony. The hardwood floors and furniture create a cozy atmosphere. 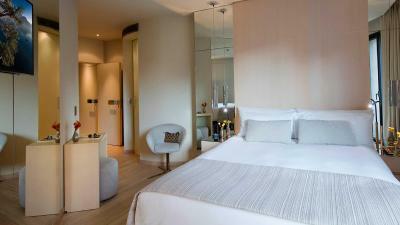 This stylish room has a round bathroom, a king size bed, a flatscreen TV, and a large private terrace. The hardwood floors and furniture create a cozy atmosphere. 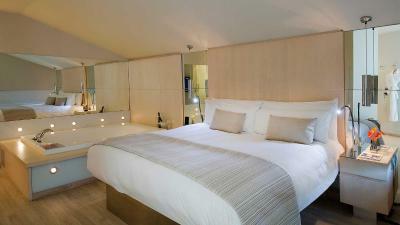 This stylish room has a round bathroom, a queen size bed, a 40-inch flat-screen TV, and a large private terrace. The hardwood floors and furniture create a cozy atmosphere. 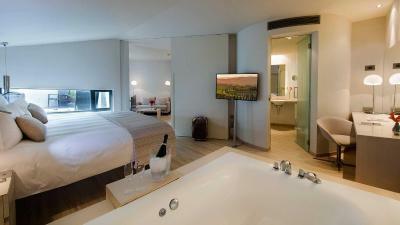 This spacious suite features a separate living area, private terrace and spa tub. House Rules Cram takes special requests – add in the next step! Cram accepts these cards and reserves the right to temporarily hold an amount prior to arrival. Nice and friendly staff, excellent location, clean and comfortable. The staff was very slow. The room was beyond claustrophobic and bad organized. 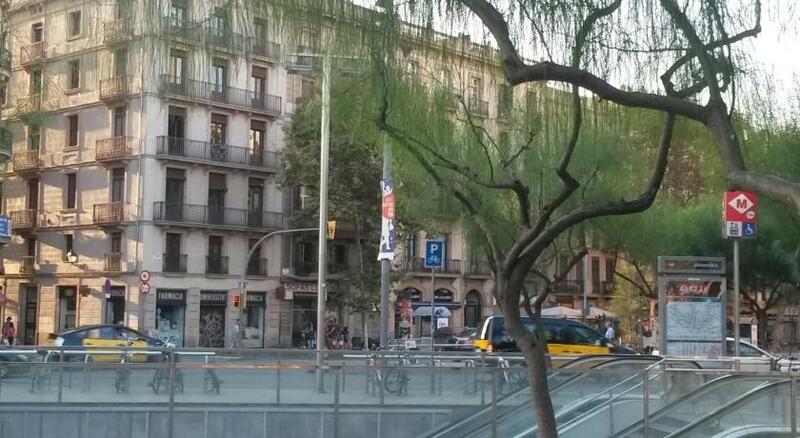 Location is close to Catalunya square, but if you walk a lot around the city you'll need a metro or taxi sometimes. Upon our late arrival receptionist suggested to make a reservation for us at near by restaurant , it was nice of him. We were very happy with our comfortable bed and balcony with a street view. We've also enjoyed breakfast at cafe "Brunch and cake", they have long lines, but it's worth waiting. Overall, Cram is perfect place to stay at the city and we really liked their terrace on photos, but it was closed till the beginning of the season. the Wifi connection was pretty bad. Location was perfect, in a business area. Really nice Hotel and location. There's a little trash can in the shower room and that's it. We did not have a garbage can in the room and there was nowhere to throw things. There is a large closet whose part can not be opened because of the television. Large room, comfortable bed, quiet (good insulation). The shower room is comfortable and well equipped. Two elevators so we did not wait long. The staff is very nice, always smiling and ready to help. Close to public transport, supermarket, restaurants and cafes. No tea and coffee facility in room. It should be improve facilities maintenance. The safe and door of the balcony in our room are broken.even though the staff fixed it on second days. 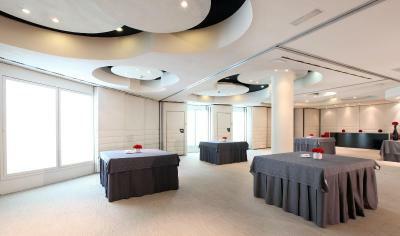 The hotel is situated near to Plaza Catalunya and from there you can reach all attraction points. At the check in the receptionist was very kind and she gave us a room even that it was too early for that according to the hotel policy. Big plus for that. 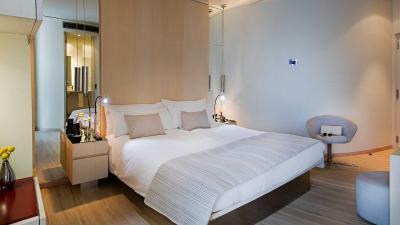 The room was clean and bed was big and super confy for 2 persons. The room has an excellent view of the main street with windows isolated enough to estompate the noise from the traffic bellow. The room needed some serious renovation, I would not recommend this hotel. But the worst part is that they asked me for a credit card at the reception and it was the first and only time I was using that card and 2 days later I have an unauthorized payment attempt from Dublin. Don't give them your credit card details!!! The room should be equipped with a desk for working people. Could not get AC to run, or get any fresh air. Only two plugs available, 1 of which did not fit; and the consoles for lights sounded like short-circuiting. Location was OK, shower great, Cleanliness, space, sound insulation good. The design and location of hotel. Lack of ventilation causes mist in the shower and It’s hard to bring in fresh air. Excellent location, nice staff, quiet rooms. The light switches are annoying. The room we stayed in on the first night had various problems. Staff were very helpful and changing rooms was easy. Friendly, competent staff. Nice beds.